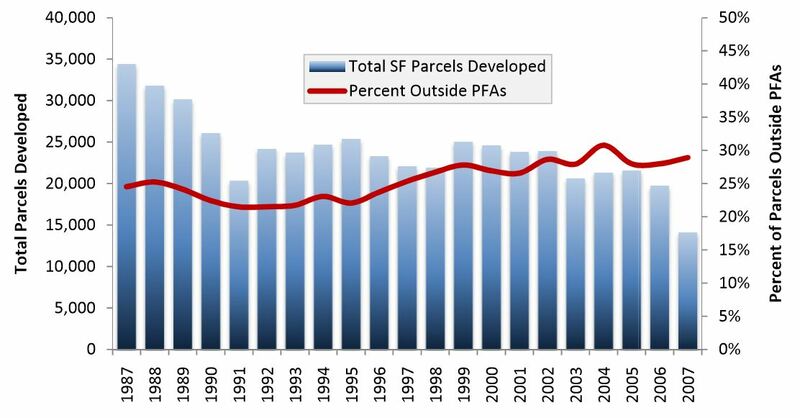 Total number of single-family parcels developed, and the percent developed outside designated Priority Funding Area boundaries, 1987-2007. Maryland is often referred to as the birthplace of smart growth. 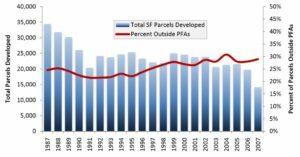 The state adopted a Smart Growth Program in 1997 with the primary purposes being to use incentives to (1) direct growth into areas already developed and having public facilities, and (2) reduce the conversion of farm, forest, and resource land to urban uses. The Maryland Smart Growth Indicators Project represents the NCSG’s effort to monitor the progress of the state’s Smart Growth Program. The project was the most comprehensive assessment of Maryland’s smart growth program to date and involved the collection of over 100 indicators of growth in categories of: population, employment, transportation, land use, housing, and the environment/natural areas. In January 2011, the NCSG released a report concluding that Maryland is making only slow and barely discernible progress towards smarter growth. The study found that in several smart growth performance measures such as multifamily housing construction, per capita vehicle miles traveled, housing affordability, and compact development, Maryland has largely tracked national trends, and has not measurably gained ground over the last decade. For more details, please view the report and its appendices, which can be accessed below.